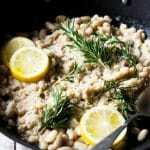 The easiest white bean mash made with cannellini beans, rosemary, lemon and garlic. A super quick and healthy alternative to mashed potatoes. Add one tablespoon of olive oil to a large pan and saute the garlic and rosemary for a few seconds, don't let the garlic brown. Add the cannellini beans with the lemon juice, zest, another tablespoon of olive oil and a good pinch of salt and pepper. Cook the beans for 2-3 minutes, then start to mash them with a fork. At this point you can decide what consistency you'd like the bean mash to be. I like to mash around half of the beans for a rustic style mash. For a creamy consistency add a splash of water or stock (around 1/2cup/125ml) and mash them all with a fork until creamy.